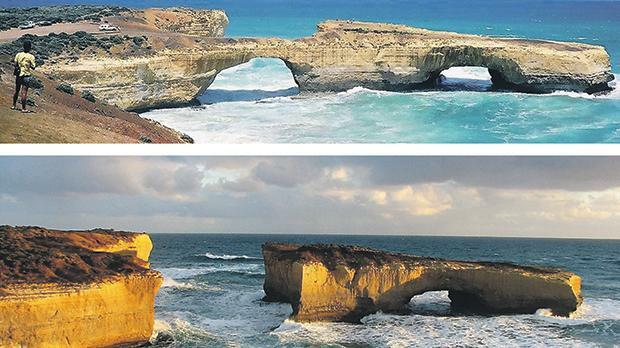 The collapse of australia’s london Bridge arch. The recent collapse of the Azure Window in Dwejra elicited a mixed bag of reactions from Maltese, Gozitans and tourists in the local and international media and social networks. Understandably, Gozitans registered a deep sense of loss at the overnight disappearance of their much-loved landmark and money-generating tourist attraction. Many Maltese shared these sentiments, while others opted for the humorous touch, posting witty memes and comments on Facebook. Several suggested some form of remedial action, including the absurd suggestion of reconstructing a faux arch. The collapse was widely featured in the international media, mostly because of the exposure the Window had received after it was prominently featured in the television series Game of Thrones. Few, however, are aware that this was by no means a unique event and that several similar collapses have occurred in the past. In Gozo itself, the island rock at Ghar Qawqla in Marsalforn represents the remains of an arch whose bridge or span had collapsed. The collapse of the Marsden Rock arch in South Shields, United Kingdom. One of the most celebrated natural rock arch collapses is that of Australia’s London Bridge Arch, so called because of a perceived resemblance to the iconic bridge in the British capital. Situated near Port Campbell in Victoria, this tongue of land with two natural arches was, like the Azure Window, a major tourist attraction. On January 15, 1990, the span of the landward arch suddenly disintegrated and plunged into the ocean, leaving an isolated rock with the remaining, smaller arch. As in the case of the Dwejra arch, this natural event made headlines throughout the world, mainly because two visitors were stranded on the island rock and had to be winched to safety by helicopter. Dave Darrington and his cousin Kelly were on the seaward side of the span when it collapsed. Visiting the site 25 years later, Darrington described the momentous event: “I thought I saw a little bit fall off and then a little bit more fell off and then suddenly the whole lot just fell down in front of our eyes,” he said. He recalls hearing a huge crack as thousands of tons of rock became detached and fell into the sea. A few moments earlier he had been reassuring his cousin about the safety of the bridge after she had asked if it was safe! Luckily, the stranded pair were noticed by other visitors to the area and after three hours they were airlifted to safety by helicopter. 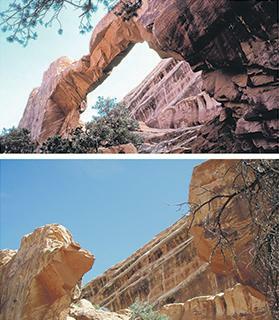 The collapse of Utah’s ‘Wall Arch’. 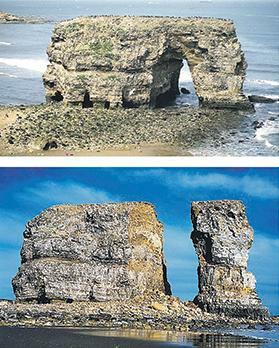 Another renowned fallen arch is that of the Marsden Rock in South Shields, northeast England. This case is interesting because both the formation and the collapse of the arch happened in the recent past. Marsden Rock was a sea stack, surrounded by the sea at high tide, about 90 metres from the cliff face. 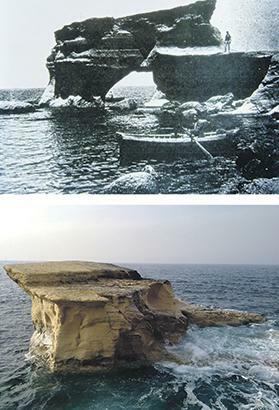 In 1911, a large section of the rock fell off, turning it into a natural arch. The continuous tidal erosion in the area considerably weakened the arch structure and it finally collapsed in 1998. This left two separate rocks, the smaller of which was later demolished as it was deemed to be dangerous. The remaining rock is an important seabird colony, home to thousands of fulmar, gulls and kittiwakes. Across the Atlantic in the US, an inland natural arch which was given the name The Wall Arch. This arch was formed over untold thousands of years, mainly by the action of wind-blown desert sand. This striking arch was situated in Utah’s Arches National Park, which boasts no fewer than 2,000 natural sandstone arches of different shapes and sizes. The Wall Arch, 22 metres wide and 10 metres high, was one of the most impressive. Unfortunately, the arch disintegrated between August 4 and 8 of 2008. Further north, in the Canadian island province of Nova Scotia, a basalt rock arch known as The Eye, which had been formed through volcanic activity, disappeared overnight in October 2015. This arch was one of the province’s main tourist attractions and, like the Gozitans, Nova Scotians were shattered at the loss. “That hole in the island was beautiful and unique,” said one. “We see people all summer taking pictures.” The Eye was situated on one of five islands off Nova Scotia’s Atlantic coast. 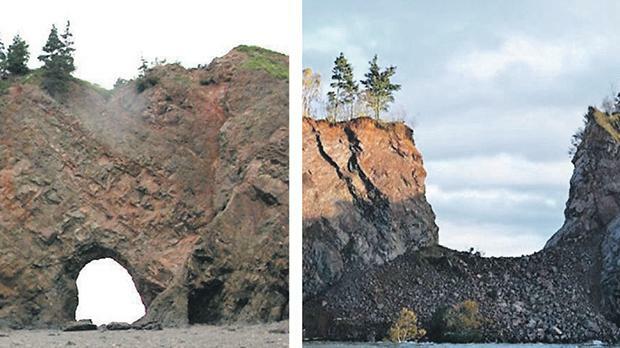 The collapse of the arch known as ‘The Eye’ in Nova Scotia. The most recent arch collapse, less than six months before that of Dwejra’s Azure Window, was the sudden disintegration of one of two arches on Legzira Beach, south of Agadir, a prime tourist resort area in Morocco. A pile of rubble was all that was left after this natural wonder came tumbling down on September 23, 2016. Legzira is one of the world’s most beautiful beaches. It is famous for stunning sunsets punctuated by the rock structures jutting out from the cliffs. Fortunately, the second, larger arch remains standing further along the beach. A natural arch is defined as a rock exposure that has a hole completely through it formed by the natural, selective removal of rock, leaving a relatively intact frame. Such removal could be the result of one of several natural processes of erosion, including wind action, wave action, water flow, climatic events and volcanic activity. The processes contributing to arch formation can also be responsible for their destruction. The Natural Arch and Bridge Society, an international body which promotes the study, appreciation and preservation of natural arches and bridges, has estimated that there are about 30,000 significant natural arches in the world. Its website (http://www.naturalarches.org) features over 500 natural arches in 76 countries in the gallery section. Malta’s Azure Window and Blue Grotto were two of them, now sadly reduced to the latter. So Gozo’s Azure Window was certainly not unique after all, and neither was its fall. Admittedly, the Dwejra Arch was one of the most beautiful, and its demise was certainly a sad loss. It was formed by nature and nature took it away. 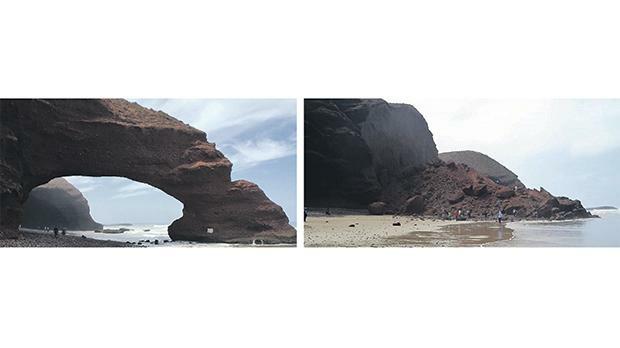 The collapse of the Legzira Beach Arch in Morocco.